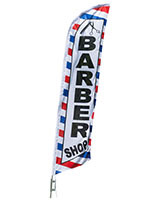 This beauty salon swooper is a great choice for any business in the spa and nail or hair care industries. 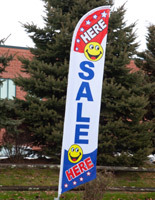 Each 14' pre-printed polyester flutter flag advertises esthetics services using a hot pink background and bold yellow messaging. 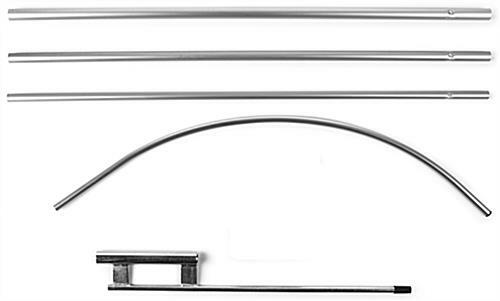 This nail or hair care salon swooper assembles quickly and easily using the included sectional aluminum pole. 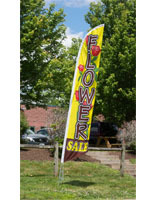 This spa industry banner with stock advertising message has a ground spike base that provides stability when used in soft dirt, grass, turf, sand, or packed snow. This high visibility printed swooper features fade-resistant dye sub printing and is outdoor-rated for winds up to 40mph. 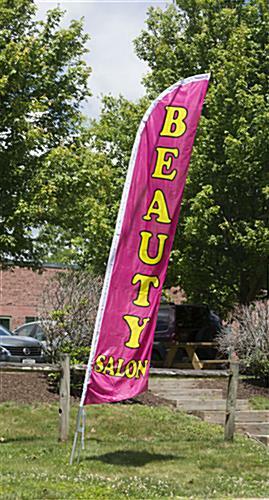 This nail and hair care or spa messaging banner is an economical way to attract the attention of passers by on foot or in cars.